When the electrical stimulus from the AV node is not conducted by the left branch, a Complete Left Bundle Branch Block (LBBB) occurs. This interruption of the impulse must arise before the subdivison of the Left Branch, because the injury of a single fascicles causes Left fascicular Block. If both fascicles of the Left Branch are affected, Left Bundle Branch Block also occurs. 1. Atrioventricular Node and Bundle of His. 2. Normal Right Bundle Branch. 3. Blocked Left Bundle Branch. This condition causes the electrical stimulation depolarize the left ventricle abnormally, because it is only conducted by the right branch. The stimulus initially depolarized regions dependent on this branch (right ventricule and right third of the interventricular septum). Then, the stimulus passes through the myocardium towards the left ventricle, increasing the time of ventricular depolarization (Broad QRS Complexes), resulting in abnormalities in the electrocardiogram. Wide QRS (> 120 msec). Lead V1: Broad QS Wave. Lead V6: Broad R wave. The R Wave may show a notching at its peak (M shape). Absent q waves in leads I, V5, and V6. In lead aVL, a narrow q wave may be present. Abnormal repolarization: ST segment and T wave are opposite to QRS (ST depression and negative T wave in V5-V6) 1. Tip: To determine whether an Electrocardiogram with wide QRS has a Left Bundle Branch Block or a RBBB, just watch leads V1 and V6. At the beginning of the QRS complex, a small r wave in lead V1, and a small q wave in lead V6 are observed. They reflect the depolarization of the left septal region (first region to depolarize). Subsequently, both ventricles are depolarized, with a predominance of the Left Ventricle, resulting in a deep S wave in lead V1 and a tall R wave in lead V6. In Left Bundle Branch Block, the septum is depolarized from the right branch in left-right direction (contrary to normal), disappearing the initial r and q waves in leads V1 and V6 respectively. Subsequently, both ventricles are depolarized, with a predominance of left electrical forces, but total time for left ventricular depolarization is prolonged. This causes a negative and deep QRS comples (QS) in lead V1, and a wide and tall R wave in lead V6 2. Electrocardiograma normal: Narrow QRS complex. Lead V1 shows an rS complex and lead V6 shows a qR complex. T waves are normal. Electrocardiogram with Left Bundle Branch Block:Wide QRS. QS wave in lead V1 and broad R wave in V6. In Left bundle branch block are also repolarization changes, secondary to abnormal depolarization. So, there is ST segment depression and negative T wave in chest leads with tall R wave (V5 and V6). Tip: T wave should be deflected opposite the terminal deflection of the QRS complex. Unlike right bundle branch block, left bundle branch block is usually associated with heart disease. Left ventricular hypertrophy secondary to arterial hypertension or aortic stenosis. Valvular heart disease: aortic stenosis, mitral stenosis, aortic regurgitation. Dilated cardiomyopathy and hypertrophic cardiomyopathy. Degenerative conduction system disease (older patients). May appear at high heart rates (aberrant conduction). It is rare, but can be observed in patients with completely normal cardiac studies. Left bundle branch block may be the first evidence of undiagnosed heart disease. 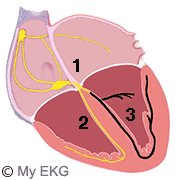 Every patient newly diagnosed with left bundle branch block requires complete cardiac evaluation. In the absence of underlying heart condition, Left Bundle Branch Bblock does not need treatment. If the LBBB was caused by a heart disease, this disease should be treated. Patients with symptoms of Acute Coronary Syndrome and unknown Left Bundle Branch Block must be treated as ST segment Elevation Myocardial Infarction (Primary angioplasty or Fibrinolysis). Patients with heart failure, Left Bundle Branch Block can cause left ventricular asynchrony (septum and lateral wall contract asynchronously), this condition often worsens the symptoms and the patient's prognosis. Resynchronization therapy usually improves ventricular function and reduces mortality of these patients. Permanent pacemaker implantation is indicated for Alternating Bundle Branch Block (LBBB alternating with Right Bundle Branch Block)3. 3. Vardas PE, Auricchio A et al. 2007 ESC Guidelines for Cardiac Pacing and Cardiac Resynchronisation Therapy. Eur Heart J 2007; 28: 2256-2295.